Loved the quality! Nice looking product. Slumber under the sea with the Coastal Life cotton quilt set. With scallop shell designs quilted in, the ocean atmosphere is always close. Available in seafoam, coral, green, and white colorways the Coastal Life quilt is perfect for mixing and matching with your coastal decor or on it's own paired with your favorite accent pillows. 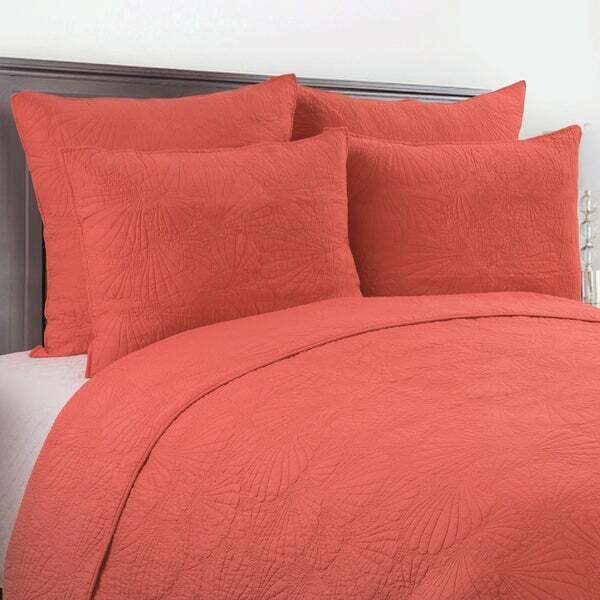 Crafted of 100-percent cotton this quilt set is machine washable for easy care. Pair with the coordinating euro shams, available separately. Color is perfect and the fit is generous. A great set for our new guest room. The fact that it’s 100% cotton is a bonus. "Can we see pictures of the other color options?" Hi there! There are 4 colors available in this quilt - seafoam, coral, green and white. We have checked and all of the images are showing, so we are a little unsure of how to assist you further.